Benchmade makes fantastic knives. Their H&K line of knives are built in their factory with the HK logo. Each one of these knives carry the legendary craftmanship as well as the warranty of a Benchmade knife. One of the extremely popular styles of knives they build are the AXIS knives. These knives have a pull slide in the handle that allows you to either unlock the blade (from the locked open position) or to open the knife. This particular knife the 14255, is a manual folder that can be opened by pushing on the thumb stud. The blade glides open easily. The 14255 sports a tanto point blade with a plain (unserrated) edge. One of the very nice things about this particular model is the G10 handles are built flat. This means the 14255 has an extremely thin profile for very comfortable carry in your pocket. The pocket clip is reversible for right or left handed users (tip up). 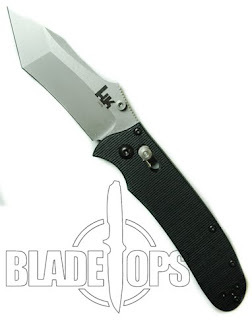 Benchmade recently released their first H&K knife designed by Steirer Eisen. This knife, the Monochrome Folder Knife, is built strong and durable for whatever circumstances you may find yourself in. The drop point blade is made of N690 stainless steel (RH of 58-60) and has a length of 3.04″. This all black blade looks and cuts good. The blade is opened with either of the ambidextrous thumb studs. As you slide it open, the blade opens smooth. As the blade opens, there is no feeling of looseness or wobble that you sometimes find with some folder knives. The blade locks in place with a monolock. A monolock is similar in nature and function to a framelock with a slightly different look. At a full 7.37″ when open, the Monochrome is a big enough knife to get nearly any job done. The handle features some jimping at the top on both the spine and the belly of the handle. The jimping makes for a solid grip. The skeletonized handle reduces weight and gives the Monochrome a great look. Available in either a standard plain edge blade (Model 14320BK) or in a part serrated blade (Model 14320SBK), the Monochrome is a nice, affordable folder knife built by a company you can trust. Tumult OTF Knives back in stock! 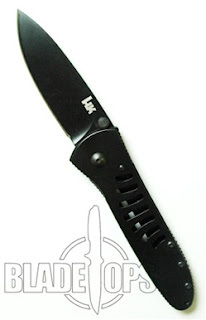 We were able to get several of the Benchmade H&K knives back in stock. 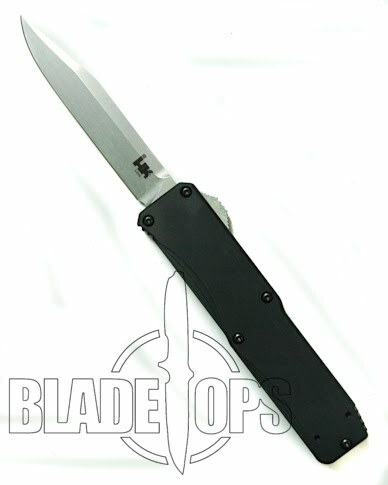 The Tumult, if you don’t already know, is an out the front knife built by Benchmade as part of their H&K line of knives. This OTF has good solid action. It is a dual action OTF, which means the slide trigger on the side of the handle opens and closes the knife. It is made with a variety of blade styles, either with a black finish or the ever classic stainless look. And either of these blades can be found with a plain edge or with partial serrations. This is a great all around OTF knife. Author adminPosted on July 16, 2010 Categories auto knives, benchmade, otf knife, out the front knifeLeave a comment on Tumult OTF Knives back in stock!